We have released Vibracart Paypal V1.6 with support for cart wide and item based discounts and coupon codes. This flexible system provides a number of discount types such as discounts on orders over a certain amount, item discounts for multiple quantities, discounts on groups of items or on items purchased together. 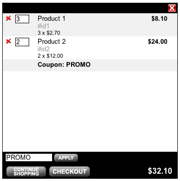 Each discount type can be tied to a required coupon code as well.